Horse riding in Tuscany in the romantic Chianti Hills from a 400-year-old farmhouse. Enjoy horseback riding or walking, visit the art cities of Florence, Arezzo and Siena, and take in the hidden treasures of Tuscany. Rendola Riding is a Tuscan farmhouse and riding center is located on the slopes of the Chianti hills with views over the Arno valley in famous Chianti region between Florence and Siena. Travelers may feel more like honoured guests and quickly become friends in this relaxed, home setting. Settle in and then enjoy a chat and a glass of Chianti Classico wine in the garden or sitting-room. This is not fast riding country, but there is so much to look at that speed is not an issue and in a week’s stay, riders will never do the same ride twice. Horse ride on trails through vineyards, olive-groves and woodland without any landowners objecting and without meeting a single gate, something that never ceases to amaze. Visit abbeys, castles, Romanesque churches, wine-farms and medieval villages. Enjoy lavish picnics at lunchtime and in the evening the riders will dine and sleep in comfortable farm holiday centers or small hotels. The Tuscan cooking, is, of course, a great attraction. Franca the cook has a large repertoire of pasta, rice and meat dishes and typical Italian sweets and can satisfy vegetarians. Most of the vegetables come from the organic garden. The olives for the oil are picked on the premises and eggs, turkeys and ducks are all home produced. The farmhouse for Rendola Riding is at the centre of a small organic farm. It has over three hundred olive-trees and produces all the extra-virgin olive oil used in the kitchen. There is no vineyard, but local farmers supply excellent Chianti wine. If you wake up early in the morning and look out of the window, you will see horses grazing peacefully among the olives in front of the house. You will hear birdsong and smell the delicate perfume of wisteria and jasmine and possibly a whiff of manure as well... yes, it really is another world. helmet- Please note- you need to bring your own helmet. gloves, if you are used to wearing them. Otherwise dress according to the season. Remember you don’t need to dress up at the farmhouse. There is a washing-machine and an iron if you need them. Other useful items for Tuscany horseback riding: suncream, lip balm, personal medicines, small camera, gilet with pockets or fanny pack. There are plenty of books in English at the farmhouse. There is a hair-dryer in each bedroom and an Internet point in the sittingroom. All guests are advised not to bring too much luggage. Bulky suitcases hamper you during your journey and are probably full of unnecessary stuff anyway. Reserve some space, however, for anything you might want to buy during your stay. Eighteen horses are kept in the stables at Rendola Riding immediately behind the house or in the surrounding fields for your Italy equestrian vacation. They belong to various breeds including Arabs, half-thoroughbreds, one Morgan and several Sicilians. The others are, well, just horses, chosen because they are comfortable, willing, surefooted, easy to handle and, above all, safe for all levels of ability. The horses, all trained in the English style of riding. Your host is British and maintains her horses to a high standard. They are sleek and fit and even those which are stable-kept spend some hours in the paddocks every day if they are not ridden. There are two rings: a small one for beginners and a large one for more experienced riders who want to improve their style in flatwork and over small jumps. The BHS instructor, speaks English and works hard to help nervous riders. If riders feel inclined, they are welcome to help with the grooming and tacking up of the horses, an excellent way of making friends with their mounts. 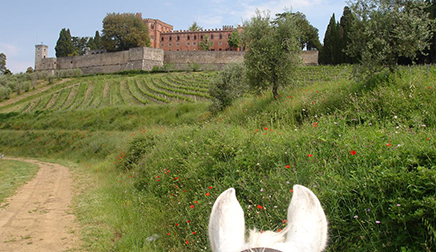 This Tuscany horseback riding vacation is appropriate for riders and their non-riding companions. The Tuscan farmhouse is roughly at the center of a triangle formed by Florence, Arezzo and Siena. These famous art cities can all be reached by car in less than an hour, while Florence and Arezzo are accessible also by train. You can explore the Chianti region and the Casentino valley, areas rich in historical sites and natural beauty. You may also like to sample minor Tuscany, fascinating locations in the vicinity which do not however attract mass tourism: the medieval tower of Galatrona, the rose-garden of Caviglia (which boasts the largest collection of roses in Europe), the gardens and cellars of the Abbey of Coltibuono, the Romanesque church of Gropina with its animal carvings and ninth century pulpit, just to give a few examples. Every Thursday morning there is a large market in Montevarchi where an expert eye can pick up real bargains, while on the first Sunday of the month there is an important antiques fair at Arezzo (30 km). There is a Prada outlet only 4 km away, while at the Mall in Incisa Valdarno you can buy on the cheap (it's all relative) the creations of Valentino, Gucci, Armani, Ferragamo and so on. And if you want to take home some of the local produce, there is no better place than the covered market at Montevarchi, where every day you can buy produce directly from the farmer: olive oil, wine, salami, sheep cheese, honey and the vegetables of the season. Relax in the garden with a book and a glass of wine. If the weather does not permit this luxury. move to the sittingroom and sit in front of the log fire. If reading is too much like hard work, you can chat, listen to music or have a snooze. A traditional, small family-run farm on the slopes of the Chianti hills, Rendola Riding is in a peaceful setting looking out over the Arno valley. Hens and ducks peck around the house, the family dog lies on the doorstep, and you may find the cat curled up in your chair. It is first and foremost a riding centre; the stables are immediately behind the house, and horses graze in the surrounding paddocks. The house itself is clean and pretty, but it is after all a family home, with books spilling out of the shelves and jackets hanging on the back of chairs. There is a spacious dining room where you have meals and, with the Chianti wine flowing, this is probably where you will spend the evenings. There is also a sitting room and plenty of books for you to browse through. There is a free Wifi connection in the house and access to a computer. There are six bedrooms, all with private bathrooms and showers. The furnishings and decorations are simple, but clean and comfortable. On the Castles Ride, you stay two nights in Siena. This is usually at the Cannone d'Oro, once a thriving coaching inn. The Tuscan cooking, is, of course, a great attraction. At meal-times the guests all sit together at a long table and there is plenty of merriment as well as good food. Franca the cook has a large repertoire of pasta, rice and meat dishes and typical Italian sweets. Vegetarians are well accommodated. Most of the vegetables come from the farmhouse's own garden. The olives for the oil are picked on the premises and eggs, turkeys and ducks are all home produced. Riders for horse riding Tuscany should be experienced and fit intermediate to advanced riders who are able to walk, trot and canter and want to see Tuscany on horseback from a relaxed, farmhouse setting. This classic Italy riding vacation week is diverse, including three half-days and two whole days’ riding, Tuscan cooking, wine-tasting and sightseeing, lunch at a gourmet restaurant, and a visit to a Tuscan market. Highlight: a guided visit to Arezzo to see the famous frescoes of Piero della Francesca. * USD based on Euro pricing, which may change based on currency conversions. Rates include: transport, accommodation, all meals with wine and coffee except lunch on free day, 3 half-day rides, two whole-day rides with picnic + other activities described in itineary. Not included: expenses incurred on free day. Closest Airport: Florence or Pisa. Transfers: Included from Florence train station, which is a short taxi ride from Florence airport. There are regular trains and buses from Pisa airport to Florence train station. The Discover Tuscany riding vacation is based at the farmhouse. Three half day rides and two whole day rides alternate with a variety of activities: from a lesson in Italian to shopping at the local market and from lunch at a gourmet restaurant to a guided visit of the frescoes of Piero della Francesca. Note that riding can be substituted by walks and/or cooking lessons for non-riders, or riders who need a rest from the saddle! Make your arrangements to reach Florence main station (Firenze Santa Maria Novella). At 17.50 meet either Jenny Bawtree (middle-aged, white-haired and wearing a red Rendola shirt) or her son Nicholas (tall, dark and handsome) outside the Feltrinelli bookshop and snack bar opposite platform 14. (There is a luggage depot nearby if you need it.) You will be accompanied on a forty-minute train ride to Montevarchi and then on a ten-minute drive to Rendola, the 400-year-old typically Tuscan home of your hosts. Settle in and then enjoy a chat over a glass of Chianti Classico wine. Dinner and night at Rendola. Breakfast and morning ride (about two and a half hours) through vineyards, olive-groves and woodland, passing near an 11th-century tower and a 14thcentury church. Return to Rendola for lunch. After a short siesta and possibly a guided walk to introduce you to the local flora and fauna, join your host for a lesson in Italian pronunciation which will prove useful over the following days (learn, for example, that the “ch” in the Italian word bruschettais pronounced like a 'k'!). For dinner, freshly made pizzas followed by dessert. Breakfast and morning horseback ride (about two and a half hours) in the wooded hills north of Rendola, scattered with charming hamlets and traditional farmhouses. After lunch go to the ancient city of Arezzo and enjoy a guided visit to the fascinating, world-famous frescoes of Piero della Francesca of which your host has made a special study and then to the main square made familiar by the film “Life is Beautiful”.There is a chance to do some shopping. Dinner and night at Rendola. Day horseback ride and picnic in the Chianti hills south of Rendola (about five hours in the saddle). During your ride you will pass the medieval village of San Leolino, a lake and the castles of Cennina and Lupinari. Dinner and night at Rendola. A free day to make your arrangements for sightseeing, perhaps to visit Florence (if she is available your host will gladly give you a guided tour of the main sights) or the hill towns of Cortona, Assisi or Orvieto – take your pick. All three are an easy train journey from Montevarchi and you will be driven to and from the station. Alternatively there could be a wine-tasting visit to Montepulciano and Pienza (minimum 4 people), to be paid for on site. Dinner and night at Rendola. Either a morning ride or a guided visit to the local town of Montevarchi and its famous weekly market: a good chance to pick up bargains! Lunch at a gourmet restaurant in Loro Ciuffenna, a medieval village built round a ravine on the other side of the Arno valley. Drive back to Rendola and have either an afternoon ride or a lesson with our BHS instructor in the school. Dinner and night at Rendola. A final day ride five hours in the saddle) to the top of the Chianti hills (nearly 2,500 feet) behind Rendola. Enjoy a barbecue on the ridge beside a boarhunters' hut and ride back to Rendola via the village and castle of Montegonzi. A farewell dinner and, if desired, a visit to the local pub. Please note: If riders want a shorter break, they can do the first days (Saturday – Wednesday) of a Discover Tuscany week, which would be equivalent to the ‘Taste of Tuscany’ programme. This short break Italy equestrian holiday is the equivalent of the first four days of the Discover Tuscany classic riding vacation itinerary. Rates include meals and nights at Rendola, 2 half-day rides, 1 whole-day ride with picnic, guided visit to Arezzo. A short but sweet center-based Tuscany riding holiday! Go to the main railway station of Florence (Firenze Santa Maria Novella) and at 17.50 meet your host Jenny (middle-aged, white-haired and wearing a red Rendola shirt) or her son Nicholas (tall, dark and handsome) outside the Feltrinelli bookshop and snack bar opposite platform 14. (There is a luggage depot further up that platform if you need it.) After a forty-minute train journey to Montevarchi take a ten-minute drive in a minivan to Rendola, the 400-year-old typically Tuscan home of your host. Settle in and then enjoy a chat and a glass of Chianti Classico with your host, either in the sitting room or outside the farmhouse with its panoramic views. Dinner and night at Rendola. The morning ride takes you through charming hamlets in unspoilt countryside and also introduces you to a ‘casa leopoldina’. After lunch a short trip by train to the ancient city of Arezzo and a visit guided by Jenny of some of its most notable sights, including the frescoes of Piero della Francesca. Opportunity to shop. Dinner at Rendola. This is riding vacation week specifically for riders at Rendola Riding who are also art lovers. Your host Jenny is not an art historian, but is passionate about medieval and early Renaissance frescoes. She has studied them over the last few years while living in Tuscany, and is happy to share her enthusiasm to other art lovers. The tour includes many of the most famous frescoes of Tuscany! Riding, art and great Italian food... we can't think of a better vacation! You'll see the most famous frescoes of Arezzo, Siena, Florence and San Gimignano. Own arrangements to reach Florence main station (Firenze Santa Maria Novella). At 17.50 meet either Jenny Bawtree (middle-aged, white-haired) or her son Nicholas (tall, dark and handsome) outside the snack bar at the beginning of platform 16. You will be accompanied on a forty-minute train ride to Montevarchi and then on a ten-minute drive to the farmhouse, a 400-year-old typically Tuscan home of your hosts. Settle in and then enjoy a chat and a glass of Chianti Classico wine. Dinner and night at the farmhouse. Breakfast and morning ride (about two and a half hours) through vineyards, olive-groves and woodland, passing near an 11th-century tower and a 14th century church. Return to the farmhouse for lunch. After your siesta Jenny will give you an introduction to the fresco, one of the main art forms of medieval Tuscany: its origins, the basic techniques, its role on the road towards the Renaissance. Dinner at the farmhouse. Breakfast and morning ride (about two hours), passing the hamlets of Loccano and Noferi with its views of the local ’smotte’ which inspired Leonardo da Vinci. After lunch a visit to Siena to have a look at the magnificent frescoes in the Town Hall. If desired, also a visit to the famed cathedral with its Renaissance frescoes in the Libreria Piccolomini. Dinner at the Rendola farmhouse. A guided visit to Florence. Highlights of the day: the frescoes and altarpiece of Ghirlandaio in the church of Santa Trìnita, the frescoes of Giotto and his pupils in the Basilica of Santa Croce and finally a visit to Jenny’s favourite church, the Basilica of San Miniato on a hill overlooking the city, to see the frescoes of the 14C artist from Arezzo, Spinello Aretino and other even earlier frescoes. Lunch in Florence, dinner at the farmhouse. A two and a half hour ride passing the Pianacce and skirting the village of Caposelvi. After a light lunch, a short trip to Florence by train, a visit to the frescoes of Benozzo Gozzoli in the Palazzo Medici-Ricciardi and then a train journey + taxi ride to San Gimignano. to spend the night in a charming ‘residenza d’epoca’. A pizza supper at a local pizzeria where, according to Jenny, you will have the best pizza of your life! A visit to the 14C frescoes in the Duomo, which must be at the same time the most charming, dramatic and even unconsciously humorous frescoes you will have seen this week. Then (optional) a visit to Le Cellole, an intact Romanesque church of great beauty to listen to sung prayers by the resident monks. A light lunch nearby in San Gimignano and thence to Florence and home for dinner and night at the farmhouse. Breakfast and then a ten-minute journey to Montevarchi station to meet the train back to Florence. Own arrangements for your onward journey from Florence. For those going to Rome there is a direct and inexpensive train from Montevarchi every three hours. ** This itinerary is flexible and subject to change based on the trip guide's discretion, the weather or other factors. If a rider's behaviour or lack of riding ability should put at risk his own person or that of the other riders, this outfitter has the right to ask her to discontinue the ride. A flexible Tuscany riding holiday for families with children aged 10+. Maximum 8 riders, non-riders welcome. There will be three half-day rides (all different), two whole day rides with picnics (those for whom a whole day is too much can ride just in the morning or in the afternoon), a visit to Siena, home to the famous Palio race and a whole day in Florence with a programme specially designed for children. Day 1: Own arrangements to arrive to reach Florence main station (Firenze Santa Maria Novella): you can either fly into Pisa and take the coach to Florence, or fly into Florence airport and take the shuttle-bus to the main station. It is possible to rent a car by prior booking at either airport. Those without a car will be met at 17.50 outside the snack bar at the beginning of platform 16 either by Jenny (middle-aged, white-haired and wearing a red shirt) or by her son Nicholas (tall, dark and handsome). You will be accompanied on a forty-minute train ride and then a ten minute drive to the farmhouse, the seventeenth-century typically Tuscan home of your hosts. At dinner a chance to discuss activity options for the week. Day 2: After breakfast the riders can help to prepare their horses in the stable behind the house. For the less experienced children there will be, if necessary, an assessment lesson in the school with Eraldo, a friendly, English-speaking instructor, followed by a short ride out; for the others a two-hour excursion. This way your host can see which horse or pony is suitable for each rider. After lunch a guided walk to a medieval tower and a climb to the top of it. Dinner at a local pizzeria. Day 3: A two-hour ride for everybody in groups of not more than five riders (the ride can be swapped with a riding-lesson if preferred). After lunch a drive to Siena (48 km) to see the famous square where the Palio race is run and to watch a documentary about it. Optional: a climb to the top of the 13C town hall! Dinner at the farmhouse, with a dessert of special Sienese sweets. Day 4: A day ride in the hills with picnic, where non-riders can join the riders. If the whole ride is too much for some riders they can do just half a day. Dinner at the farmhouse. Day 5: a train-journey to Florence for all. Highlights for the children will be climbing the dome of the cathedral and a delicious Italian icecream! Adults could see the new cathedral museum with famous artworks by Michelangelo, Donatello, Lorenzo Ghiberti and Luca della Robbia. Dinner at the farmhouse. Day 6: A visit to Montevarchi market for souvenirs and possibly to Montevarchi’s famous fossil museum. A drive to Loro Ciuffenna, a charming medieval town built round a ravine, where the highlight is a working mill dating from the 12th century. (The miller is pretty ancient, too). A picnic lunch in Chiassaia, a small mountain village famous for its ‘schiacciata’, a tasty flat bread filled with delicious Italian ham and pecorino (sheepcheese). Back at the farmhouse for another ride before dinner. Day 7: Another day-ride with a barbecue picnic, which non-riders can join the riders. Delicious bruschette and grilled meat! As before, some riders can participate doing just half a day’s riding. Dinner at the farmhouse. Day 8: After breakfast take the train back to Florence or depart by car. A variation of the Discover Tuscany Riding Vacation, with same amount of riding but a special emphasis on Tuscan cooking and wine-tasting. Highlight: an optional guided visit to Montepulciano to taste its famous Vino Nobile. Rates include: transport, accommodation, all meals with wine and coffee except lunch on free day, 3 half-day rides, two whole-day rides with picnic + other activities described in programme. Not included: expenses incurred on free day. A new horseback riding vacation in Tuscany, Italy including riding, wine tasting and Tuscan cooking. Plenty of sightseeing, too! Make your own arrangements to reach Florence main station (Firenze Santa Maria Novella). At 17.50 meet either Jenny Bawtree (middle-aged, white-haired and wearing a red Rendola shirt) or her son Nicholas (tall, dark and handsome) outside the Feltrinelli bookshop opposite platform 14. (There is a luggage depot further up if you need it. )You will be accompanied on a forty-minute train ride to Montevarchi and then on a ten-minute drive to Rendola, the 400-year-old typically Tuscan farmhouse of your hosts. Settle in and then enjoy a chat over a glass of Chianti Classico wine, a must when in this part of Italy. Dinner and night at Rendola. Enjoy a two and a half hour horseback ride with Eraldo. After lunch an informal talk about Pietro, a peasant farmer and his traditional Tuscan cooking. (You will have received his cookbook).Then a stroll through the woods on the Pietro trail, followed by a traditional dinner at the Osteria di Rendola 500 m from your Tuscan farmhouse. Take a two-hour ride through Tuscany's countryside with Eraldo. After a light lunch a visit to Pratomagno, the mountain (1,591 m) on the other side of the Arno valley, first to see the Romanesque church of Gropina and then either a visit to the town of Loro Ciuffenna for an icecream or a gentle walk of one and a half hours between the mountain villages of Rocca Ricciarda and Poggio di Loro. Dinner at Rendola. Saddle up for a day ride with Eraldo, with barbecue lunch. Pizza dinner at Rendola. Two and a half hour horseback riding adventure with Eraldo and after lunch cooked by Franca excursion with Eraldo to a cheese farm and a winery. Dinner at Rendola. Day horseback ride with Eraldo OR a trip to Siena or Lucca with Jenny. Dinner at Rendola. Departure after breakfast or continue your adventures in Tuscany. *Itinerary is subject to changes based on the weather or the trip guide's discretion. Please use the above only as a guide. The meals were terrific. Sergio is the understated backbone of the farm. He (and Jenny) made sure everything was running smoothly, from the horses being readied for us to ride to making sure we had train tickets, shuttling us around in the farm van to cooking wonderful food. I am craving his mushroom risotto and grilled eggplant. Jenny and Sergio are a great team. The rides themselves were magical. The scenery was so breathtaking. I am glad we kept the riding at a slower pace although brisk trots and rolling canters (in an organized fashion) kept our senses keen and added some of fun. Jenny's horses were wonderful - steady and trustworthy and very comfortable. I would have loved to taken Nerone and Carmen back to the states me. Our excursions to Arezzo and Loro Ciuffenna with Jenny were fantastic. She kept us enthralled with her unbelievable knowledge of history and art. Sharon and I barely made a sound as she told us about the villages history and the artists and church frescoes. Even other tourists quietly sidled up to us trying to hear what she was talking about. Jenny truly seems to love teaching and is an excellent teacher and tour guide! There is much more I'd love to tell you about the experience and am happy to talk to other future travelers. Thank you so very much for making our first equestrian vacation a wonderful one. And....many, many thanks to Jenny Bawtree! Our guide, Jenny, was an inspiration. She works very hard, is a most competent rider and knows history well. She couldn’t have been nicer – deserves much praise for the work she does. Jenny's house is warm, beautiful, cozy. The meals were delicious! The best Italian food I've ever eaten. Great guide, wonderful scenery, amazing horses, fabulous food. Couldn't be bettered! I'm longing to go back. The horses were fit and very well cared for. I felt that there was a high level of horsemanship. We also loved the knowledge of art history and the Italian language that Jenny shared with us. Jenny did a wonderful job of hosting! Caring for needs of guests! My husband is a non-rider but brought a bike. Jenny had very good information on roads, sights, places for his rides which made a perfect vacation for him, too! Thank Jenny for looking after all details to make this a SUPERB vacation – it went too fast! Jenny was wonderful, brilliant, kind and knowledgeable about local art and customs and of course, horses. Such a nice mix of riding and sightseeing. Shopping too! I know you are probably off in the countryside on another ride, but I wanted to send you a note of thanks for putting together such a wonderful riding vacation for me! I so enjoyed your company, your house, your staff, all the great food, your fine horses, and most especially your infinite knowledge of the amazing wooded landscape all around your area. My time in Italy exceeded all my expectations and I loved every minute….. Thank you again for all that you do, and also for being a great inspiration. A wonderful and memorable holiday in a beautiful landscape. Such pleasant walks and rides, excellent and amusing company and conversation, lovely food, everyone kind and thoughtful. You know how happy I always am at Rendola and how much I love to come. Your care of both the horses and riders is unsurpassed and it’s wonderful seeing the same cast of characters (with minor changes) year after year. This was absolutely the best trip yet and I’ll begin saving for next year as soon as I get home. -- Andrea Beauchamp, after her fifth visit to Rendola. Intermediate and advanced. Moderate paced rides. Riders must be able to walk, trot and canter. Discover Tuscany for Families- NEW! The age-limit for children is ten (twelve if they are to take part in riding-programs) always accompanied by an adult.